Prepare the coleslaw dressing and set aside. For the burgers, combine all of the ingredients together in a large bowl and mix together until the chicken is combined with all of the ingredients (including two tablespoons of the coleslaw dressing you made previously). Patty the chicken burgers into large patties. Heat a flat griddle (or outdoor grill) to medium-high heat. Once the griddle is hot, spray with non-cook spray or drizzle some olive oil on the pan. Place the chicken patties on to the griddle and let them brown on the bottom side of the burger. Once the burger is nicely browned on the bottom, flip to the other side to continue to cook. Turn down the heat to medium-low to make sure the patties are cooked all the way through to the center. While the patties are cooking, prep the rest of the coleslaw. Slice the cabbage very thin. Add to a salad bowl. Slice the green onions and cilantro and add to the cabbage. Pour the rest of the coleslaw dressing on to the cabbage and toss. When the patties are cooked, place a hot patty onto the bottom of the hamburger bun. Top the patty with some of the coleslaw and then serve. 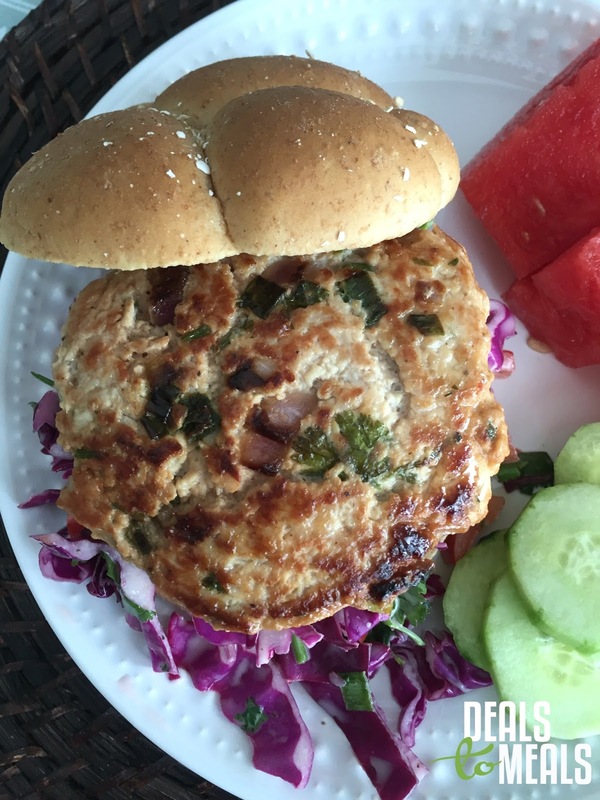 HEALTHIER OPTION: Serve on a whole wheat bun or serve bunless. Oh man! You got a good deal on the ground chicken at sprouts! I just paid 4.49 for a pound yesterday there! Do you buy the breast when it's on sale and have them grind it? I have been having them cut my breasts into fajita strips lately. I would love to buy the ground chicken when it's only 1.99 a pound! Thanks so much for the info and for watching it for me! I love your blog!